HOMTIME Bluetooth Alarm Clock Speaker with USB Charging. 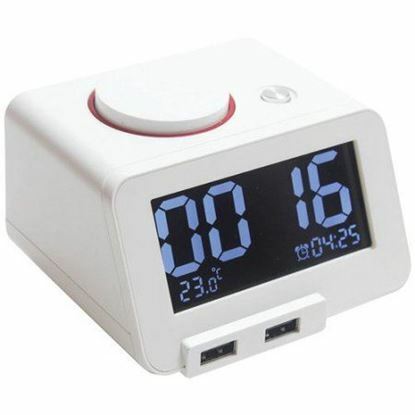 2W HOMTIME Bluetooth Alarm Clock Speaker with USB Charging. 2W Speaker. Dimmable 3.2" LCD display. 2x USB charge ports. Card slot for alarm tones. Thermometer. PROMATE Wireless Multi-Function speaker with integrated QI PROMATE Wireless Multi-Function speaker with integrated QI charging station. LED alarm clock. FM radio function USB charging port. Colour beige. PROMATE Wireless Multi-Function speaker with integrated QI PROMATE Wireless Multi-Function speaker with integrated QI charging station. LED alarm clock. FM radio function USB charging port. Colour brown. PROMATE Wireless Multi-Function speaker with integrated QI PROMATE Wireless Multi-Function speaker with integrated QI charging station. LED alarm clock. FM radio function USB charging port. Colour sepia.